An analysis of forest management in the Budongo Forest and its effect on local wildlife. This article is based on research by Dr. A Plumptre. The Budongo Forest Project which began in September 1990 has discovered that carefully controlled selective logging can be beneficial to some species of wildlife, but detremental to others. At Budongo, harvesting was mainly for mahoganies. 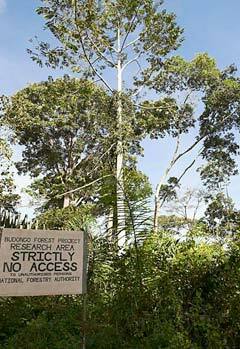 BFP studies have shown that from the 1930s to the 1980s between 25 and 45 cubic metres of timber per hectare were removed from Budongo, and that over this period the percentage of mahogany varied from 65% to 75 %. At the same time, arboricide was used to reduce the numbers of ironwood trees in the forest. Despite the heavy offtake of mahoganies, our studies in the 1990s show that the forest has made a good recovery, at least as far as the wildlife is concerned. Where mahoganies and ironwoods once stood we now have an abundance of fruiting trees such as figs, which provide food for a wide variety of birds, primates and other species. As a result, densities of these fruit-eating wildlife species have increased. Species of insectivorous birds have not benefited from forest management practices. Flycatchers and ground-feeding insectivores seem to be affected by changes in forest structure following logging and arboricide treatment. Although today we have higher densities of wildlife in the logged forest than in the unlogged forest, this does not mean that "logging is good for wildlife". It all depends on how the logging is carried out, and it is important that parts of the forest are set aside as protected areas which are never logged in order to protect the full complement of species. Excessive logging has been studied in other parts of Africa and in Asia. It can have a catastrophic effect on wildlife, even leading to disappearance and extinction. Fortunately this does not appear to have happened in Budongo. Following the findings that (a) the mahoganies did not show an increase in stem density or basal area in heavily treated areas, and (b) that the mahoganies only produce fruit at a largetree size, it is recommended that more research investigates the success of replanting practices. In the 1950s replanting of seedlings was abandoned because of poor success and high costs, and some trial plots investigated the replanting of saplings. These replanting plots should be reinvestigated to look at the success of different replanting strategies. The high levels of illegal pitsawing in Budongo will reduce the value of this forest to managers and conservationists because of the loss of its good records of timber extraction. These records are what mark out Budongo as an exceptional forest. To achieve better record-keeping, local pitsawyers need to be licensed and to work with the Forest Department. In addition they need to be motivated to keep records by a share of the money generated by the felled timber. The finding that mahoganies only produce fruits when at a large size shows that the need for 'seed trees' to be left in all coupes is of great importance until more is known about the fruiting and seedling dynamics of these species. This finding should also encourage the use of monocyclic felling practices because monocyclic felling allows some of the trees just below diameter limits to reach a large size and hence produce considerably more seed before the next felling. Stockmapping should mark mahogany trees that are to be left to provide seed for natural regeneration. Now that elephants are gone from Budongo, chimpanzees have become the major seed dispersers for a wide variety of tree species. The reason for this is because of their wide ranging travels. Thus efforts should be made to conserve the population in Budongo, estimated by Plumptre and Reynolds (1994) to be around 570 individuals. Studies should be made of tree species composition of the forest, seedling dynamics and wildlife before and after logging. The advantage of 'before and after'studies is that they are of the same part of the forest and thus avoid the errors resulting from comparison of different areas with different ages and histories. Dr A. Plumptre made a study of the large number of records of forestry activities by the Forest Department from 1936 to the present time. Initially logging operations were aimed at removing all the old timber trees above 1.3m DBH (salvage felling) and creating a two-stage uniform crop of trees which would be felled at 40-year intervals (polycyclic felling). During the 1950s it was realised that the slow growth rates of the trees meant that polycyclic felling would not work and a plan was made for monocyclic felling over an 80-year cycle. Minimum girths for mahoganies were reduced to 1.1m and there was replanting in logged areas to encourage regeneration. Later it was found that natural regeneration was just as successful as replanting and replanting ceased. Canopy opening was found to assist growth of mahoganies during regeneration and this was achieved by use of arboricides applied to so-called 'weed' tree species, particularly Cynometra. This treatment ceased in the 1970s. Records of the history of the 71 compartments in the forest were kept in triplicate at the Forest Office, the District Forest Office and at Forest Dept. HQ, and they survived the Amin era. They were studied by Dr Plumptre. He found data on (1) dates of logging (2) date of arboricide treatment, (3) volume of arboricide applied (4) volume of mahogany timber harvested (5) total volume of timber harvested (6) area of each compartment (7) elephant damage. Dr Plumptre's studies show that the Forest Department was not very successful in promoting the use of timber species other than the mahoganies, which provided more than half of all timbers felled, a situation which persisted until recently. The volume of timber removed from the forest in the past by one sawmill greatly exceeds the volume that could today be removed by all four sawmills in the forest. Aerial photographs show that arboricide treatment of the forest did encourage the forest type that supports mahoganies (Mixed Forest). However, study of inventory data did not show any increase in eitherKhaya orEntandrophragma stem density or basal area in heavily poisoned areas when the effects of position in the forest and time since logging were removed from the analysis. The size and number of mahoganies in Budongo reflects the natural composition of the forest and not the effects of Forest Department activities. Wildlife,especially primate biomass was shown to be greater in logged areas than in Nature Reserve, and this was later shown to be because a greater number of trees producing fleshy fruits arises after logging and arboricide. Mahoganies produce fruit later in life than many of the other species in Budongo. Many mahoganies only produce fruit at 80 cm DBH, but the current felling limit for the mahoganies is 70 cm DBH and at this diameter not all trees have yet started to produce fruits. Felling them before they produce fruits removes their seeds from the gene pool.